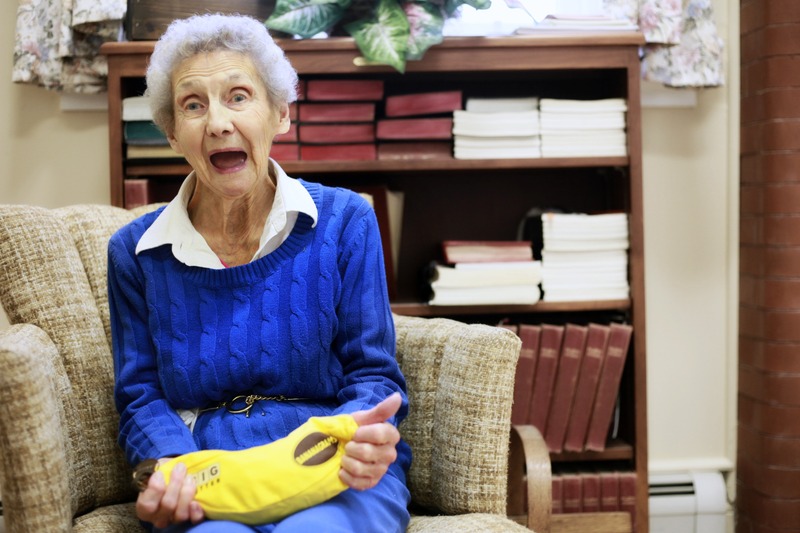 What Does Bananagrams Have to do With Macular Degeneration? Sometimes you write a letter and nothing happens. Sometimes you write a letter and something BIG happens. 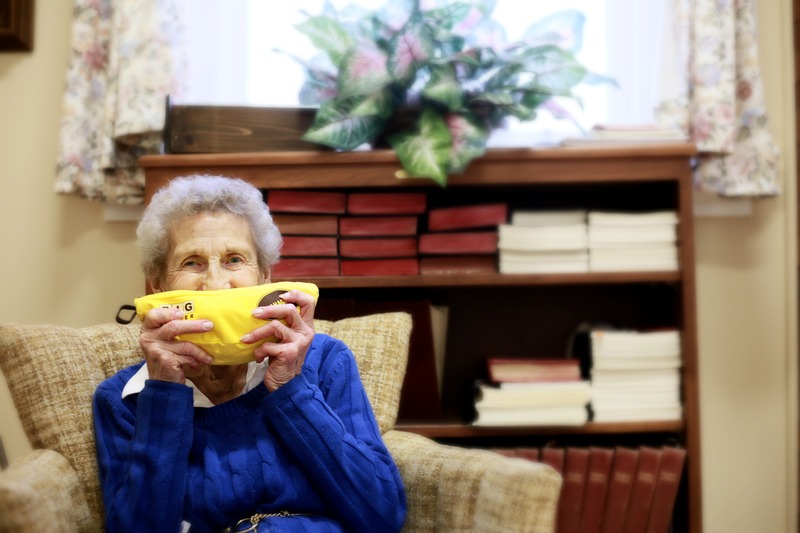 Something big happened when Dodi Peterson wrote in to BANANAGRAMS™ to ask a question on behalf of her mother, Jan, who was losing her sight to macular degeneration. Little did Dodi know that her letter would spark the development of a whole new version of the game, raising money for macular degeneration, and an awareness campaign. When the team at Bananagrams read Dodi’s letter they decided to create something special for Jan – a large print version. The original plan was just to make the one copy for Jan, but as they looked into macular degeneration they realized how many people suffer from vision loss due to macular degeneration or other causes. It became clear that a big letter version of the game should be part of their product line. Bananagrams worked with vision loss professionals to make sure the size and font of the tiles would be accessible. Big Letter Bananagrams is available on Amazon. Now that the game was developed, the Bananagrams team decided they wanted to do more. They wanted to help raise awareness and support research. That’s when they reached out to AMDF and told us about the new game and their plans. 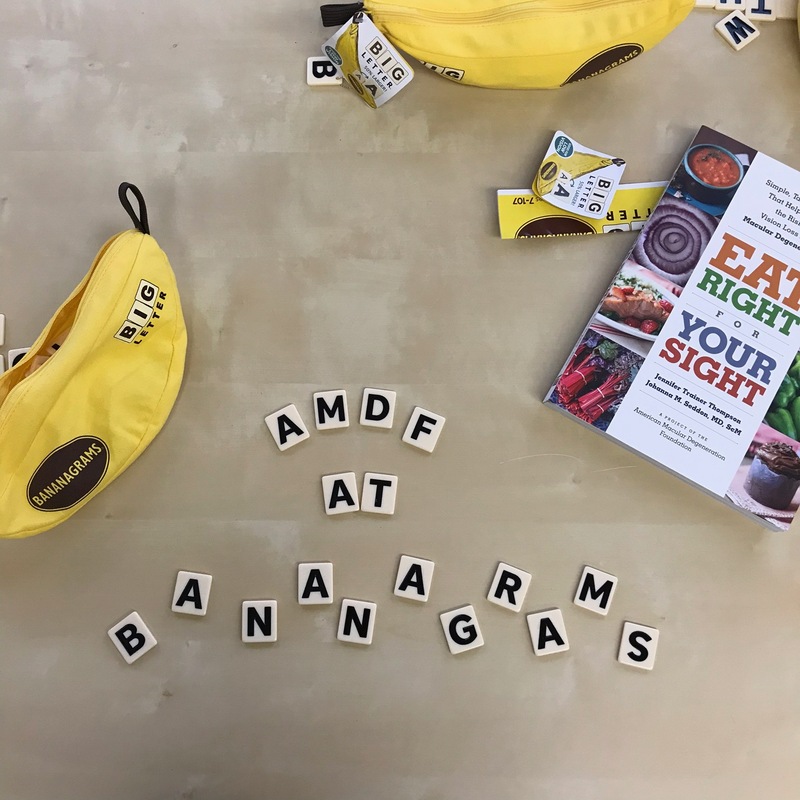 In addition to donating proceeds from Big Letter Bananagrams to AMDF, they wanted to partner with us to raise awareness about macular degeneration with a fun campaign. We talked with them about how they had developed the game, and once we learned of the effort they had made to ensure the game was accessible to people with low vision, and we tried it out ourselves, of course we were on board! So we went to Rhode Island, home of Bananagrams headquarters, to help them kick off the launch of Big Letter Bananagrams. 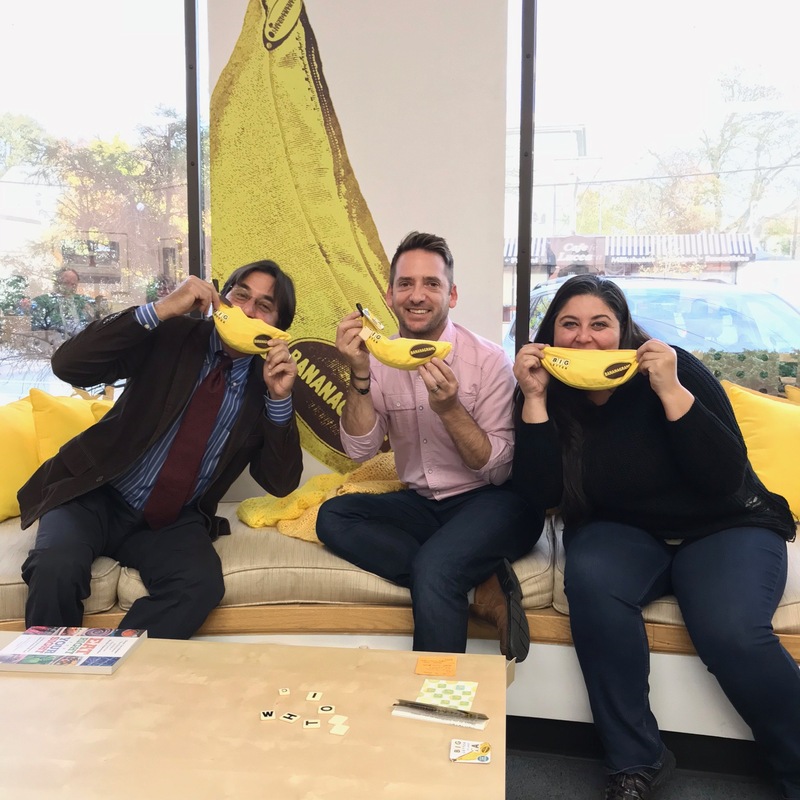 To help kick off the launch of Big Letter Bananagrams, we traveled to Rhode Island, home of Bananagrams headquarters to meet with the team and broadcast a live interview on Facebook. AMDF’s Matthew Levine (left) sat down with Marketing Director Derek Weston (pictured center), and Design Director Kendra Harrington (pictured on the right), for the live interview. We talked about their visit with Jan, the inspiration behind the game, and bringing her the first copy of Big Letter Bananagrams. At AMDF, we were excited about another, invisible benefit of the new game design. Vision loss due to macular degeneration is associated with loss of independence, isolation, depression and cognitive decline. 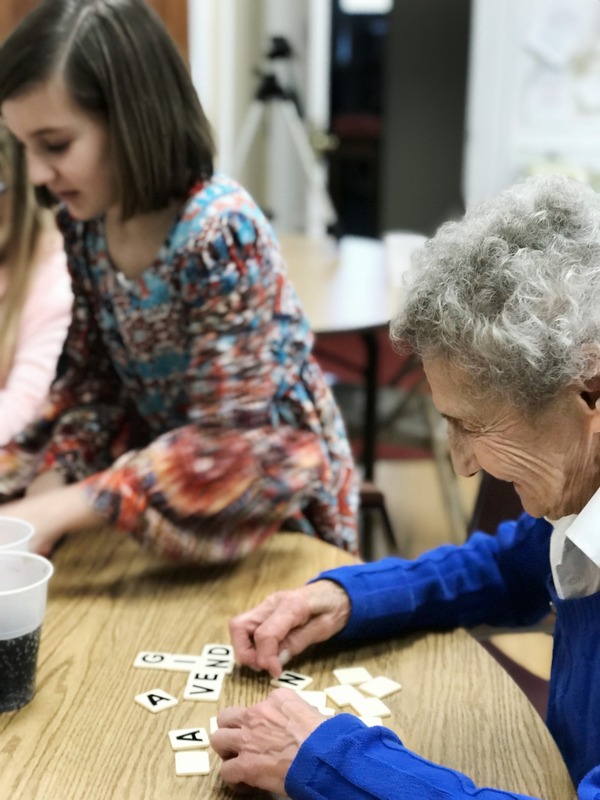 By creating an accessible game that’s both fun and brainy, and creating the Bring Big Smiles campaign, Bananagrams has also created a product that can help ward off some other quality of life declines that some people with AMD experience in a fun way. Click here to download a PDF about play and macular degeneration. Bring Big Smiles (#BringBigSmiles) is the campaign to raise awareness about macular degeneration. The idea is to share the game with someone with age-related macular degeneration (AMD), or if YOU have AMD, to invite others to play with you. Sharing and playing the game with others can help break down isolation, exercise the brain, re-connect families and communities, and, well, put a smile on everyone’s face. Bring the game to your next family gathering and watch multiple generations come together for some shared play. Tell them how the tiles and letters are bigger so that everyone, including people with low vision, can play easily. Bring the game to your local retirement communities, senior centers, community gathering places, where there are likely to be several people coping with low vision issues including macular degeneration. Watch the faces light up as people realize how easy and fun the game is to play and how they can ditch the reading glasses and magnifiers! Battle isolation by inviting neighbors and friends for an evening of game play. Sure, the tiles are bigger, but it’s the same game that everyone enjoys! Every time you share Big Letter Bananagrams with someone is an opportunity to educate others about macular degeneration and vision loss in a fun way. Every time you share Big Letter Bananagrams with someone you put a dent in isolation, lift spirits, increase independence, exercise your brain, and you put a smile on people’s faces. You Bring Big Smiles. Click here to find Big Letter Bananagrams on Amazon. When one of our team members, Jennifer, first held a copy of Big Letter Bananagrams in her hands, she knew right away she was going to bring the game to her next family gathering. She brought a couple copies of the game to her family’s Thanksgiving gathering and left them on a table while she went to help in the kitchen. Twenty or so minutes later she looked over and all the kids were gathered around and already in full swing playing the game. Eleanor got pulled away to help with dessert, but the kids continued to play on. After dessert, Jennifer brought one of the games over to the table where her mother, grandmother, son and Aunt were gathered. After quick instructions, the game was afoot. Eleanor won that round, just in time for clean-up. So what’s Eleanor’s secret to winning a round of Big Letter Bananagrams? Want to help us raise awareness about macular degeneration through the Bring Big Smiles campaign? Send us your photos and stories of how you’re sharing Big Letter Bananagrams and we’ll share on our Facebook page and/or website. If you’re on Facebook or other social media, you can post to our page or your own and use the hashtags #BringBigSmiles or #BigLettersBigSmiles. Great story. Where can one purchase the big bananagram game? YAY!!! What a lovely AND savvy move on the part of Bananagram Execs to address needs of the low-vision population! It’s gratifying to see a company that listens, does the marketing research and then moves to make its product more widely accessible. Wish other companies were this smart and user friendly!! Their giving back in the form of research support is the best part of this story and again shows their community-accessibility mentality, even while enlarging their sales potential! We wholeheartedly agree Mary! We hope that this move gets other companies to start thinking about it too. I am not old, but suffers from MD, I hope in the near future we get a better solution to our vision. We were not born like this and so I believe to every problem there is always a solution. I am looking forward to it. And thank you so much to the people and conpanies having us in mind. We’re hoping for a solution too Christine.